MAPUSA: Daryl Costa’s intelligence in the closing minutes propelled Panjim Footballers Sports Club to a solitary goal win over 10-man Corps of Signal in the re-schedule seventh round match of the Goa Professional League organised by GFA, at Duler Stadium, here on Wednesday. It was a much needed for Panjim Footballers who were languishing at the foot of the league table with just five points from 12 matches. After a goalless first half, Daryl Costa scored the all important goal for the Capital side in the 85th minute. Panjim were on the front foot and in the 12th minute when Cyril Dias’ header off Alston Camotio’s free-kick just missed the target narrowly. Signal’s keeper Binu Purshothama came to his side’s rescue in the 30th minute by brilliantly pushing out Daryl Costa’s firm grounder from crashing into the net after being set up by Cyril Dias. Signals were dealt with a major blow on crossing ends when defender Om Prakash Bhogta was sent off by referee Sunil Nanodkar with a direct red card for a dangerous tackle on Panjim’s Chandan Gawas. Binu once again showing great sense of anticipation in denying Daryl from getting to the ball off a delicious cross by Alston Colaco in the 50th minute. 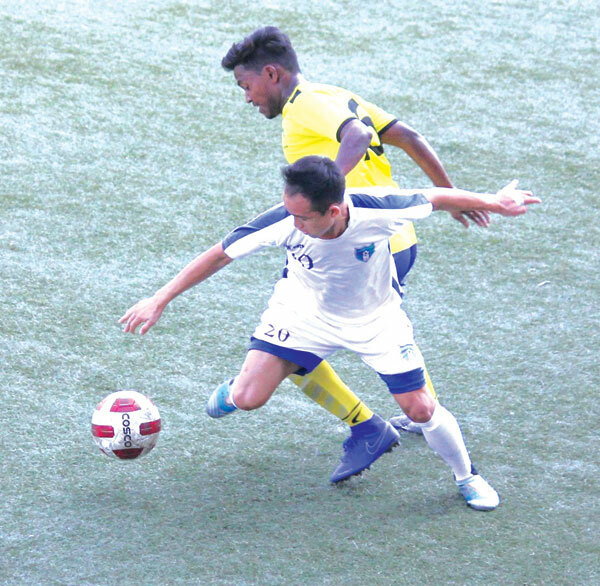 Signals who were pedestrians for most part of the game had the best chance in the 54th minute when Pawan Thakur’s hot-blooded 25-yard shot was well kept out by the diving Panjim keeper Sherwin Da Cunha. Just when it looked like both the teams would be splitting points, Panjim scored the all-important goal in the 85th minute through a stroke of genius. Daryl Costa after getting hold of a long ball in the danger box majestically lobbed the advancing Signals keeper Binu to the huge delight of their travelling fans. Signals almost levelled terms in the added time in a goal mouth scramble when Nim Tshering Bhutia’s shot from close was well stopped by Panjim keeper Sherwin and the ball came to two Army men players who just could not sort their feet to tap the ball into the net.